Members of the Mock Trial Club. THE MOCK. To you, the reader, the Mock a.k.a Mock Trial, is probably just a name you hear every once in a while on the announcements and see every once in a while on Facebook. However, to a very special group of people that are a part of the Mock, it means so much more. In order to avoid things getting utterly confusing, here’s a little background. I joined Mock Trial at the beginning of this year. Mock Trial is, to over generalize, a group of people simulating what occurs in a real court. Every year all Massachusetts schools participating in Mock Trial get the same case from the Mass Bar Association. This year the case was about a plane crash: John Jacobs dies in a stunt plane accident in July 2013. His daughter, Barry Jacobs, tries to sue the company that made plane, claiming that the plane crashed not because her father executed the stunt incorrectly, but because the plane was made cheaply and poorly.The other witnesses on Barry Jacob’s side claim that the makers of the plane cut corners to save money and that the plane was not as safe as it could have been. Corey Shinoda, the marketing executive of Caborite Aircraft (the company that made the plane) claims that the plane was made with regard to all FAA (Federal Aerobatics Association) rules. The other witnesses representing Caborite Aircraft claim that the plane was safe and that the pilot was incompetent. We, members of Mock Trial, are given an affidavits for each witness that states their background, their involvement with the case, and their position regarding the case. These affidavits are what “lawyer”s base their questions off of. Each side then builds a case and an argument. There are two sides- the prosecution and defense-and there are witnesses and lawyers to represent each side. There are three witnesses for each side and each witness has two lawyers. The “direct” lawyer tries to present the witness in a good light. The other lawyer, referred to as the “cross” layer, tries to portray the witness in a bad light or tries to point out the flaws in their affidavit. In the courtroom the witness is first questioned by the direct lawyer, followed by the cross lawyer. While each lawyer is questioning the witness, the other may object to the questions being asked of the witness. It’s ultimately up to the judge to sustain or overrule the objections. There are three preliminary trials and if your Mock Trial team wins all three you move on to the tie-breaker round. 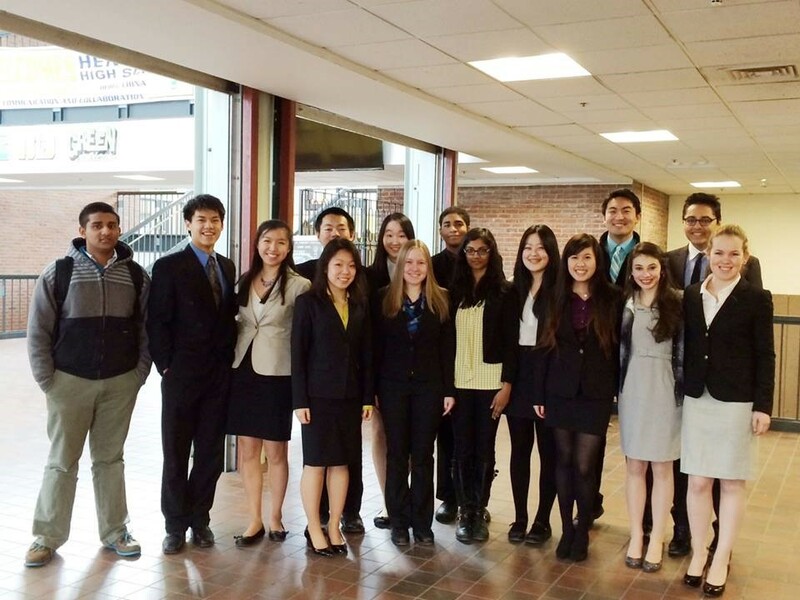 This year we, the Mock Trial Club of Andover High, got all the way to the tie-breaker. For the first few Mock Trial meetings everything seemed foreign to me and the other newcomers. Then came audition time, which would determine what role we would play in the trials. Although I had a horrifying audition in which I only knew the answers to a few of my questions, I was given a role as a witness, Corey Shinoda. As a witness my job was to answer questions to the best of my ability. My direct lawyer, Sharon Wu, was the lawyer that would be representing me in court. She had a set of questions that she would ask me in court, and we would run through these questions over and over again to make sure I didn’t just memorize the part, but that I became the part. These questions would help in setting my character up. They would point out all the good parts of my affidavit, like the fact that I, as Corey Shinoda, warned every customer of the limitations the plane possessed before selling them the plane. Answering questions asked by the direct lawyer is the easy part- answering the questions that the cross lawyer asks is what is hard. The lawyer that conducts a witness’s cross examination is from the opposing school, so the witness has no idea what she/he is going to ask. The cross lawyer’s job is to portray a witness in the worst light possible in regard to the case. For example, my cross lawyer tried to get out the fact that I’m greedy and attempted to make the plane cheaper. However, whether my cross lawyer gets this out or not depends on the way I, the witness, answer his/her questions. In order to prep for this, the lawyer who would be conducting the cross examination of Corey Shinoda from the Andover team, Irene Yang, helped me quite a bit by drilling me with questions that she might use in her line of questioning. I got better as time progressed, as did everyone else. By mid December, the amount of progress we had made was quite stunning. This was in part because of our mentor Mr. Krasnoo, the lawyer we worked with on Saturday mornings for 2 hours. These Saturday morning meetings can be accurately described by a fellow Mock Trial member, Moorea Colby who says “I no longer dreaded Saturday mornings but began to look forward to Mr. Krasnoo’s tidbits, and our dissection of the case. Although it could seem tedious or draining at times, it was always worth the excitement and anticipation before trials.” To add my two cents, I think that Saturday morning meetings became more enjoyable as we got further into the year because we became closer as a team. My team members worked very hard at perfecting their roles and were a part of the reason I was motivated to prepare well for the trial. The other reason was that the meetings were actually a lot of fun. While our meetings helped, our two leaders, Nikhil Chopra and Emily Granoff, and our advisor Mrs. Carrick helped us even more when practicing for the trials. They reminded us of the rules we had to keep in mind during trials, and taught us how to answer particularly hard questions. The fact that they were well versed in the rules of Mock Trial and always willing to help greatly aided the team in winning the first three trials. After being present in all three trials I can say that watching any trial, good or bad, is nerve-wracking. After some intense arguing, objecting, and some particularly strong performances by our team, we managed to win our first three trials. Next came preparing for our tie-breaker against Phillips Academy. We prepared three hard weeks for this tie-breaker. As best described by Nikhil, “It was amazing to see each and every member’s commitment to Mock Trial grow as the season went on. … To keep our spirits high, many of us would bake cookies and brownies, and we fondly called our group the MOCK. During our tie-breaker against Phillips Academy, every member was 100% memorized.” For example, Natalie Stamatiadis and Maggie Meng, two of the many committed members, worked for almost 3 hours straight trying to improve their question and answers. A lot of people came to meetings almost three times a week and during vacation so that we could put our best foot forward against Phillips Academy. And of course, we can’t forget Jacky Wang, who gave some of the most motivational speeches on our Facebook group page. To put it simply, everyone played an important part. Mentioned or not mentioned in this article, everyone was there when the Mock needed them to be. Although we did not win against PA, we put up a strong fight: the judge gave us superb feedback and we felt like we had won the war. As for me, I’ve learned that the Mock is something more than just a club. It’s an experience. Many of our seniors have told me that they’re very happy they joined the Mock, even if they don’t have any intentions to pursue law. I’m sad to see our many seniors go and though our team will feel very different without them, I do believe next year will be a year of possibility. Looking back, the Mock was a ton of fun, and, looking forward, I hope it will continue to be like that.